May | 2017 | LIT.GAZ. I knew Austen’s name but had disdainfully avoided reading any of the novels in a teenager-ish sort of way, until I got to university and was faced with Mansfield Park in my first term: dutifully I read and really liked the novel, which is often described as both dull and difficult compared with the others, as well as having the priggish and unlikeable Fanny Price as its heroine. Lectures and seminars opened my eyes to the wit, the language and the social issues Austen addresses; I’ve never looked back. Since then, I regularly re-read the novels every few years, enjoying their familiarity as well as noticing new details. And, as my other half is at least as enthusiastic about Jane Austen as I am, often detailed discussions and conversations ensue. We’ve enjoyed watching many film and TV adaptations of the novels, traced Austen’s path through Bath, and visited her home at Chawton and her tomb in Winchester Cathedral. I’ve enjoyed teaching all the novels save Northanger Abbey (which I avoided), particularly relishing the occasion when we had to compare Mansfield Park with Pride and Prejudice; I still haven’t fully decided whether Mansfield Park or Persuasion is my favourite: the former I find intellectually engaging, but the latter is truly about mature love and the sense of Ann and Wentworth re-finding each other and finally being united is still very powerful and moving at the nth re-reading. So, what is so good about Jane Austen? What attracts me to her world? It was a very narrow world in terms of physical scope and also future prospects, but she was clearly a highly intelligent and well-educated woman, with a keen eye, a sharp wit and a great sense of humour. She writes about what she knows about, which is both a limitation and an advantage; there is a narrowness to the settings, and her choice of characters; she never presumes to present a conversation between men where no women are present; servants are backgrounded, as is the aristocracy; because she knows the rest, she observes minutely and nothing escapes the sharpness of her eye or her comment. And, quite early on in the development of the novel, she brings in the marvellous indirect authorial comment: we are following the heroine’s thoughts, ideas, comments… or are we? who is actually thinking or speaking there… is it the author herself? because we can’t be sure… and we’ve noticed we can’t be sure. It’s very clever, and very effective. How is this ‘literature’, worthy of the Nobel Prize? How is it different from what we usually think of as literature? 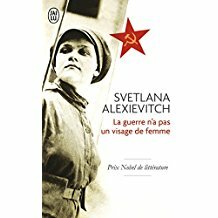 Alexievitch captures the power of witness: these women lived the war, experienced it, suffered it; Alexievitch is collecting voices to preserve forever. And although even to read some of the things they describe is so horrifying I find myself thinking nobody should read this, yet none of this must ever be forgotten. Many of the women recount the war in Belarus, and it beggars description. They return home to villages, towns where there are no males… I have not forgotten the experience, more than thirty years ago, of seeing the premiere of Elem Klimov‘s film Go and See at the London Film Festival. At the end, the entire audience – 1500 people or so – left in stunned silence. Not a word was said. The final caption on screen told us that 97% of Belarusian males between 18 and 45 did not survive the war. Alexievitch is a different kind of writer, a listener and a recorder who lets her subjects talk; she presents testimony of times and places. There is no commentary, although occasionally she reflects on what she is doing or someone she has met, in a few paragraphs. And then the listening recommences. It’s incredibly powerful and important stuff. And be warned: you need a strong stomach. Do we still want the NHS? Unashamedly political post follows…you have been warned. As a nation I feel we’ve shot ourselves in both feet voting to leave the EU; I’m sure it will happen and we will be able to repent at leisure. But, for my money, the biggest error is one we are making through neglect, or ignorance: the loss of the NHS. Think about this: the Tories have been in power for seven years, during which time they have, in a drip-feed manner, made the NHS less effective through constant re-organisation and underfunding, brought in more profit-making private providers, and under-resourced it. There is a constant trickle of stories about clinical errors, longer waiting lists, people ‘wasting’ NHS time and resources: the right-wing press is doing its bit in undermining a national resource. And so, when the Tories decide they can be bold enough to suggest privatising parts or the whole thing – in the interests of giving people better care, of course – enough people may believe them, and allow them to get away with it. And there will be the mantra that the NHS will always be free ‘at the point of delivery’ (whatever that means. Does anyone know?). Perhaps GP visits and A&E will be free, and beyond that, one will have to pay or take out additional insurance. The profit motive is expensive: profit has to be factored into the cost of everything. Of course, allegedly private enterprise is more efficient (it has done wonders for our railways, after all), so will be cheaper. I have to say, if I were seriously ill, in need of major surgery or intensive care, efficiency would not be my first criterion. Skill, care, empathy, things like those would be at the top of my list. Declaration of interest: my mother was one of the first cohort of nurses to be trained by the infant NHS, and I have a sister who currently works for the NHS. If asked, I’d be hard-pressed to think of any contemporary aspect of our country that I’m prouder of than our health service. And plenty of other countries actually envy us. Give the Tories another five or ten years, and will we still have the NHS? Do enough people actually care? I’m more than a little surprised by how many interesting books I come across when reading French newspapers and magazines; on a recent trip I went with a list of four books I wanted and came back with them all plus another must-have… and this was one of them, although originally written in English and available at a high price; the new French edition was nicely produced and sensibly priced. 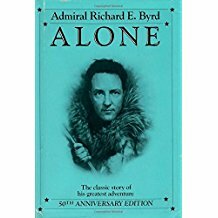 It’s an astonishing piece of exploration and travel writing from the 1930s: Richard Byrd (a US admiral) was an explorer who (among other things) set up a base on the edge of the Antarctic ice shelf, from which a small station a couple of hundred miles further inland was also set up, in order to make meteorological observations during the polar night; because it was a dangerous task, Byrd, as expedition leader, decided to undertake the task himself, spending several months alone in the polar darkness. He’s fully aware of the risks he’s taking, and begins with acute and almost disinterested self-observation. He knows he could fall ill, injure himself, get lost whilst outside, suffer from the fumes of his stove, and is several days from possible help or rescue. But it’s the psychological effects of solitude he is initially interested to observe in himself and record; he’s a very intelligent and literate man and so does this well and interestingly. Recovery from severe carbon monoxide poisoning is truly horrific, from his description: it will take months for his liver and spleen to repair his blood. He can hardly eat, vomiting most things, has appalling headaches, his eyesight is affected and he becomes physically very weak. Nevertheless he attempts to continue his weather recording, rations his use of the stove to a few hours a day because it is not possible to repair or modify it, endures dreadful cold, and will not call in help because it would mean others risking their lives. I’ve read a number of accounts of men coping with extreme conditions, and this sits alongside voyages like Shackleton’s, or, at the other extreme, journeys through places like the empty quarter of Saudi Arabia; the effects of the poisoning were truly scary and Byrd admits freely that there were times he almost succumbed to the temptation to give up: another of the effects of carbon monoxide poisoning is the inability to sleep; he had strong sleeping tablets with him, which he did not give in to the desire to take… I can see why it took four years and considerable persuasion to get him to commit his account of those months to paper. It’s an astonishing read, an account from a true explorer who was unafraid to take risks and almost paid with his life. Norman Davies is probably the leading expert on Polish history in Britain; he has written the best and most detailed academic history of Poland, as well as several books on specific episodes in the nation’s history such as the Warsaw uprising or the war with the Soviet Union in 1920. Here he attempts to trace the Polish diaspora which resulted from the Nazi-Soviet pact of August 1939 that led to tens of thousands of Poles from the eastern half of the country being deported to and imprisoned in the Soviet Union, thousands of them being deliberately murdered and thousands more dying of starvation and ill-treatment. It’s clearly a labour of love, and not one in the style of earlier academic works. It reflects Davies’ travels through many lands, and his friendships and contacts with many Poles in many countries; it’s copiously illustrated with photos, maps, drawings and detailed extracts from memoirs, and manages to give a voice to the generations which have now largely died. Davies spares no-one in his criticism and condemnation of the Allies’ betrayal of the Poles all down the line, and he’s right, I think: men who had lost everything gave all they had left in the hope of freeing their country and eventually returning home. This was not possible, as their part of Poland was ceded to the Soviet Union, which automatically regarded them as Soviet citizens, not Poles. Few did return, and of those who did, a good number disappeared. The rest remained, exiles, refugees, and not very welcome in post-war Britain. It’s a shameful story which is not widely known. 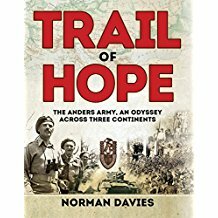 Trail of Hope is a weighty tome and a very welcome addition to the existing works on the subject. At the same time, it has its flaws, which I will charitably put down to poor proof-reading and checking at the production stage – careless typesetting, spellings and transliterations of names and place-names in many countries lack any consistency, with variations even on the same page (!). And I shall be attempting to discover why the Arnhem story is sidelined. But if you want to know about a little-known aspect of the Second World War, this is a book to read. This novel – a collection of linked stories really – is very grim and depressing, made more so by the fact that we know what came after. It was first published just after the start of the Second World War (though its publishing history is incredibly complicated, as the critical apparatus with this edition made clear), and the author is the daughter of Thomas Mann, the perhaps better-known German writer. 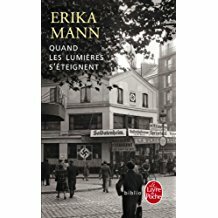 She sets her stories in a small town in southern Germany in the years between Hitler’s seizure of power and the start of the war, and bases them on actual events and people she knew. Although we know about the history of the war, and the debate about how much the average German knew about or participated in various atrocities of the Nazi era, understanding the lives of ordinary people, the choices they made, the silences they kept and the difficulties they faced, is rather harder, partly because of unwillingness to speak or to own up to their own past, and also increasingly because those who lived through those times are dying off. Much has been researched and written in recent years about how the Nazi regime extended its grip throughout society and sustained it for so long, but somehow fiction is able to bring the details and the effects to life and to our understanding in different ways. Mann uses a small number of characters – perhaps a dozen or so – in the years leading up to the start of the war. Already, then, hindsight suggests how much worse it must have been later on. There are the shortages of food, before the war starts, the gradual prioritisation of re-armament and planning for aggression and its effect on the job market and what consumers could buy; there is the growing craziness of the effects of a tightly planned economy. Smaller shopkeepers are closed down because they are inefficient, workers are increasingly detailed to particular jobs, there are expectations that everyone will take part in extra work at weekends: all of this increasing inefficiency, and the production of inferior goods, may well remind us of what we know about the various problems and eventual failure of the Soviet Union. All of these details, no doubt available in textbooks and history books, (and Mann gives us her sources), are woven into the lives of ordinary people – her characters. At some level, the book remains a warning, to everyone, to be vigilant, and perhaps in our current uncertain times of increasing xenophobia and nationalism, we should heed such warnings. Note: an English translation of the book exists, but I read the newly-published French paperback. I wouldn’t say I’m obsessed by war, but I do find myself thinking about it a lot, and I suppose given my family’s history, it’s not that surprising: my father was born and spent his early years in a village pretty much on the Eastern front line in the Great War, and ended up in England as a result of the Second World War, during which my mother was a child. I’ve recently been on my annual walking holiday in the Ardennes, and each time I’ve learned a little more about the Battle of the Ardennes in winter 1944-45, the enormous casualties and the horrors civilians endured during this last gasp of the Nazi war machine. The European project emerged from the ashes. It was idealistic: the twice-repeated horrors of the first half of the twentieth century should never happen again. Initially it was mainly an economic project, binding countries together with links and ties that eventually began to grow into a more political union. Britain was outside for a long time, a nation that had become great, building an empire on conquest and commerce and trade, and gradually losing it again. Britain had stood alone for two years, unconquered; some people felt we had ‘won’ the war. But we wanted the trade advantages of the ‘Common Market’ and strove to gain admittance; we wanted the chance to trade with a huge and growing market and make more money. I don’t think that, as a nation, we ever really understood the real thinking behind the project. We hadn’t been conquered and devastated twice in thirty years. 1973: we joined. The EEC became the European Community and then the European Union. We seem to have done well commercially and financially, but we never really wanted the rest of the project, which we seemed to see as interference in our affairs, faceless bureaucrats in Brussels wasting ‘our’ money; we never really understood what was behind it, and preferred to hang on to the US coat-tails instead. We could have been in there in partnership with the French and the Germans developing and shaping a great project. Who knows, if we had played our part, we might now have a better and more democratic Europe, more to our liking. I am deeply saddened by the turn of events, and have come to feel that as a nation we don’t understand Europe, we probably don’t belong in Europe, and that it may well be better for Europe that we are outside again. I don’t believe our politicians have a clue about what they are doing. I wish more of my fellow-citizens did understand, and shared the wish to build something worthwhile. I don’t have any illusions about the EU being perfect – far from it – but that doesn’t make it any less a noble idea.